Because you can't make one kid an R2D2 birthday card and not do a Star Wars birthday card for the other kid 4 days later so now we have Yoda for Ryan's birthday. After scouring Pinterest and Google for ideas I got to work and came up with this Yoda. The head is sponged and the top half embossed with the Decorative Dots embossing folder. The eyes are made from the Owl Punch and the ears are from the Bird punch. Yoda's body is an oval cut from Soft Suede and then topped with a Naturals Ivory robe made from an Apothecary Accent framelit shape. I cut and layered the framelit over the oval. His hands and feet are from the Bitty Butterfly punch that are trimmed down. The cane is hand cut from Early Espresso cardstock. The light saber was fun to make. I used the Word Window punch for the blade and hilt. The blade is Wild Wasabi and then I covered it with Crystal Effects and sprinkles Dazzling Diamonds over the Crystal Effects for a nice shimmery effect. I added a Very Vanilla candy dot to the hilt for a finishing touch. Yoda is adhered onto a Soft Suede card base that was stamped with Gorgeous Grunge. On the inside I printed on the printer a Yoda quote about being 900 years old. I thought it was fitting to go with the birthday theme. I got some props from Ryan on this card though he did have some suggestions to make Yoda's robe better...9 year old know it all! LOL! My boys birthdays are both in July...4 days apart. So we have a week of busy birthday activities every year. They love Star Wars and Legos and Minecraft and reading and football so it's not hard finding something to make for a birthday card. This year I went with the Star Wars theme. Who doesn't love R2D2? He's a sweet little droid isn't he? Alex got a kick out of it so it was a success in the world of 7 year olds! I decided to do some punch art for this one though it ended up more hand cutting pieces than using punches. The head is a circle punch as well as the 2 circles on the body and the legs are the word window punch, other than that I cut most of the pieces with my paper snips. It was a fun project to work on. I checked Pinterest for some inspiration and used some pictures of R2 from Google images to get the details as close as I could. The card base is Night of Navy then a layer of Silver cardstock embossed with the Lucky Stars embossing folder. I used a Night of Navy oval behind R2. I used my Smoky Slate marker to add just a bit of color to the edges of all the white pieces as it helped to give some definition to the panels on the body. The eyes/camera/sensors (I have no idea of the correct Star Wars terminology for those!) are made with Itty Bitty Accents Epoxy Stickers, a small rhinestone colored with a red alcohol marker and a Smoky Slate candy dot. The sentiment is made using the Alphabet Rotary stamp and Real Red ink. In case you're wondering "Beep Bloop Beep" is droid for Happy Birthday. It's time for another Fab Friday Challenge! This time around it's a color challenge! For some reason these colors made me think of fall. Not really sure why since they aren't really traditional fall reds, browns, yellows or oranges. Maybe I was just projecting since I wanted to use my new Vintage Leaves stamp set that saw ink for the very first time on this card. While I don't need a sympathy card right now I always like to have a few in my stash to just grab when the need arises since I find it hard to make these kinds of cards on demand. Check out this elegant look with the gold embossing! The fine details in the Vintage Leaves stamp set are just awesome and I can't wait to see some of the fabulous watercoloring I know we'll be seeing with this set once the weather starts to cool down. The Mossy Meadow panel is embossed with the Woodgrain embossing folder and then sponged with Mossy meadow ink. I cut my leaves with the coordinating Leaflets framelits and layered them over a strip of Burlap Ribbon and retired satin Blackberry Bliss ribbon. The stems are tied with a small linen thread bow. 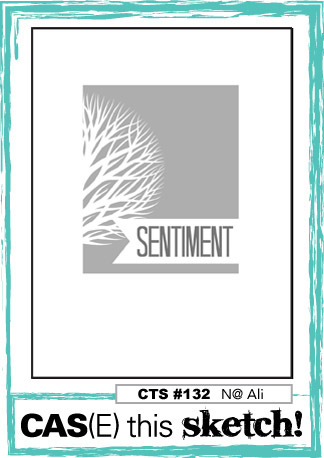 The sentiment from Petite Pairs is stamped in Mossy Meadow, punched out and then sponged. I hope you'll head over to Fab Friday to see what the rest of the Design Team has come up with. They always have such great ideas and I get tons of inspiration from them! Super quick post today! It's Vacation Bible School at our church this week and surprise, surprise...I'm one of the craft ladies! I had a few minutes the other afternoon to make a quick card to participate in the CAS(e) This Sketch challenge and wanted to get it posted before I missed the deadline. The color combination was from last week's Colour Me Challenge which has already closed but was too good not to use. A nice mix of soft and bright; perfect for a baby card. I stamped the Soft Sky square by inking up one of my clear blocks and pressing it right to the Whisper White cardstock. Next I embossed white polka dots onto a Watermelon Wonder balloon which I cut out with the Balloon Framelits. I nipped the edge off to follow the sketch and added a baker's twine string and bow. I popped it up with dimensionals. The Pear Pizzazz banner is stamped and embossed using the And Many More set. I'm off to prepare supplies for tomorrow's craft activities! After poking around Pinterest and seeing how some people were using the From Land to Sea set I was inspired to create a beach themed card. I used the Work of Art set to "color" my tag with the lighthouse stamped on it. The card base is Mint Macaron then a layer of the map paper from Typeset Specialty DSP. I added a band of black cardstock next to help set off the different colors. To make the tag I used the scallop tag topper punch with some Very Vanilla cardstock and stamped the lighthouse in black. Then I colored it in using different Work of Art stamps. The sand is Tip Top Taupe ink, the lighthouse is Mint Macaron and the sky is Soft Sky. I added a candy dot in Crumb Cake (a close match to Tip Top Taupe) to the corner and then the tie is the new Very Vanilla thick baker's twine which has a great nautical feel to it. The tag is popped on dimensionals. The Garden in Bloom is a fun stamp set to make just about any kind of card you need. I've seen so many great cards with it already and the catalog has only been out for a month. I designed this card for my New Catalog Open House last month. I was fun to mix in some of the new In Colors along with Lost Lagoon from last year's collection. The card base is Mint Macaron and then a layer of Whisper White with the the flowers stamped all over. Tip Top Taupe makes for a nice subtle outline around these flowers. The centers of the large flowers are stamped in Delightful Dijon. 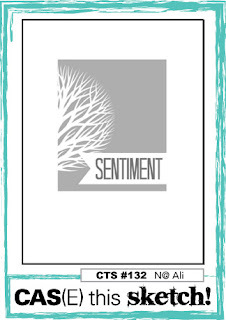 The sentiment is stamped on another piece of Whisper White and mounted across the flower panel with dimensionals. The new One Big Meaning set has a great mix of fonts and sizes so you're sure to find one that fits with your project. Last week my husband and I celebrated our 12th anniversary. 12 years sure flies by and I certainly won the first prize blue ribbon when I married him. My Barnyard Babies stamp set hadn't seen any ink year so why not....let's make an anniversary card with it. The itty bitty pig is so cute and went with the "hogs & kisses" sentiment which is love themed so that's where my idea started. I stamped 12 pigs (get it?? Dozen??) onto watercolor paper and then punched them out with the 7/8" scallop circle punch. Then I colored them in with Blushing Bride ink and a blender pen. Then I stamped the prize ribbon, colored it with Pacific Point ink and cut it out and attached it to a pig. I adhered the pigs with dimensionals to my card front which is a piece of Kraft Cardstock. I needed a slightly larger card front to fit all the pigs so this one is almost 6 inches across. Next, I had to make an envelope to fit my over sized card. I decided to do a pouch with a tab at the top to pull out the card. Using another piece of Kraft cardstock and the new Tear & Tape adhesive (love it!) I made the pouch. Then using a circle punch I notched a little opening at the top to make it easier to get the card out. Just because it isn't a traditional envelope doesn't mean the pouch wasn't getting gussied up either. My rule for my stamping ladies at class is "No Naked Envelopes"! I wrapped a bit of the new Very Vanilla thick baker's twine around it and tied a bow. After stamping and coloring another pig (I guess it's now a baker's dozen with the pigs huh?) I cut it out and attached it to a little blue ribbon. Just using the same 7/8" scalloped circle punch and the banner punch (with the banners trimmed down a bit) and Pacific Point cardstock makes for a cute ribbon! You can make large ribbons by using larger scallop circle punches and the new banner Triple punch. Better late than never right? I actually gave this card to my husband on Father's day so I wasn't late with that but I am quite late in sharing it here on Did You Stamp Today? It was fun working with some new supplies to make this card. The stamp set from Land to Sea has such nice realistic images so all those who are nature lovers are sure to be drawn to this set. I used water color paper and colored it with Pacific Point ink. I first spritzed the paper with water before brushing the ink across with my Aquapainter. After I dried it with my heat tool I tore the edge for some texture and contrast. The turtle was heat embossed with white embossing powder onto watercolor paper. I used Garden Green to color in the turtle. Again I dried it with my heat tool and then cut it out. The base of the card is Crumb Cake with the water panel adhered after adding some linen thread. The turtle is popped up with dimensionals and I added "bubbles" with the new white Perfect Accents in 2 of the 3 available sizes. The sentiment was stamped with the Alphabet Rotary stamp on to scraps of watercolor paper and then hand trimmed. This stamp isn't new to the catalog but is new to me and I don't know why I waited so long to get it. It's really nice to be able to make any sentiment that you need. Accessories: linen thread, White Perfect Accents, dimensionals, white e.p. We have family in town visiting for the week so this will be a short one! I was lucky to find some time to make my card! This is a fun sketch this week at Fab Friday! Get really detailed or keep it simple! I decided to use Watercolor Wings for the first time. I was so excited to get my big box of new catalog items and I've hardly had any time at all to play with them! You'd think summer would have lots of free time....well you're right it does but the free time has been out of state away from my stamp room! I saw this cute quilt on Pinterest and saved it for the color combination: Lost Lagoon, Smoky Slate, Basic Gray and Delightful Dijon and used it for my card. The butterfly's first layer is Lost Lagoon stamped off once to make it a touch lighter, then a layer of Lost Lagoon full strength and the body and final details are stamped with Basic Gray. The panel the butterfly is adhered to is paper pierced around the edges with the sentiment in Basic Gray. I used the Delightful Dijon marker to ink up on line of the dotted line stamp and bent it slightly on my clear block to get the flight path. I added a bit of retired Lost Lagoon satin ribbon over the embossed white panel. I used the new Fluttering embossing folder for the background. 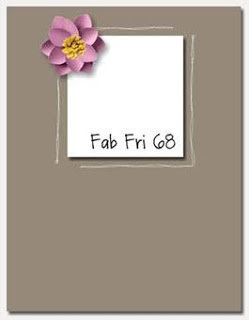 Head over to Fab Friday to see the rest of the Design Team samples and to play along! I've been MIA for the last week as I took the boys up to CT to visit my family. We had a great time and lots of fun was had but my good intentions of blogging while I was gone fell by the wayside! My plan is to try to clean out my folder of cards to upload to show some older projects over the next few weeks. Never fear though I will have some new projects to share as well. I just need to get into the swing of things again after being on vacation. Here is one using the retired For the Birds stamp set. Nothing fancy on this one but I will miss these sweet little birds! It's hard to see in the photo but the little heart is covered in Dazzling Details for just a hint of sparkle! The birds were colored with ink pads and blender pen.